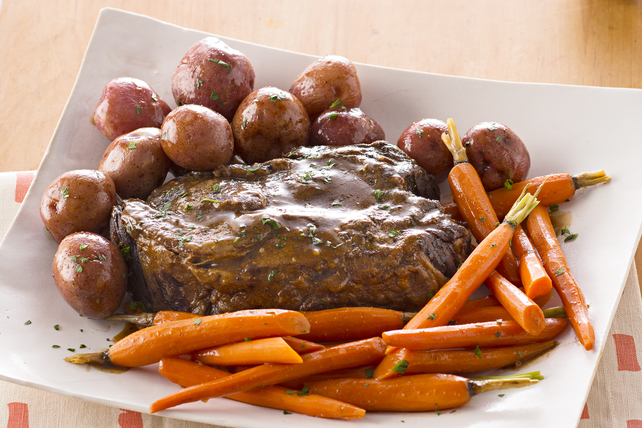 This simple pot roast is braised in the oven and produces a very tender and flavourful result. Place ovenproof Dutch oven or large deep skillet in oven 15 min. Meanwhile, mix sugar, garlic powder and pepper until blended. Sprinkle meat with rub; rub onto meat. Remove pan from oven. Add oil and meat to pan; return to oven. Bake 20 min. turning meat after 10 min. Add vegetables to pan. Mix broth and barbecue sauce; pour over ingredients in pan. Add thyme; cover. Reduce oven temperature to 350ºF; bake 2-1/2 to 3 hours or until meat is tender. Transfer meat and vegetables to platter, reserving drippings in pan. Discard thyme. Cook drippings on stove top on medium-high heat 5 min. or until reduced to about 2 cups. Cut meat across the grain into thin slices. Serve with vegetables and gravy. Garnish with 1 tsp. chopped fresh parsley before serving. Substitute 1/2 tsp. dried thyme leaves for the fresh thyme sprigs.